Hey? You like diseases? No? Then you like vaccines? Also no? Well, aren’t you a special sort of person. Basically, a couple decades ago, Andrew Wakefield released a paper relating Autism to Vaccines, and it all went downhill from there. The Anti-Vaccines group rose up, claimed non scientific facts, and turned science from a peer reviewed group of studies to a thing where opinions go a long way. 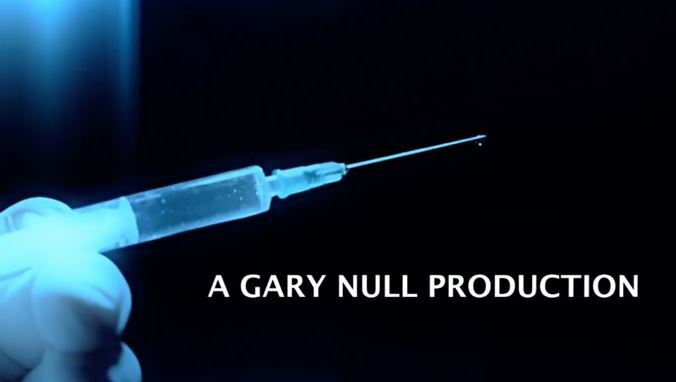 Speaking of opinions, Deadly Deception, Exposing the Dangers of Vaccines, directed by Gary Null. Who is that? Well, he is someone famous for believing in alternative medicines and being dubious with science. This is not his first documentary. He has a complete poop ton and you can see his list on the IMDB link I just showed. The crux of this documentary is that vaccines are bad, not tested enough, don’t even work, and actually are worse for people overall. You know, things you may have heard before. And let me just say this aspect before the picture. This documentary on a just technically level is badly put together. It is full of movie making graphics to distract the viewers. We get odd fade outs between talking points or within the same talking point. Every speaker has their name/title on the screen (good!) but it comes up in a right to left flying in graphic instead of just…being there, serving as a minor distraction and making it actually hard to see who these people are. It has words flying into the screen in big bold red letters to scare, and important sentences for their argument on the screen with someone talking completely different words, to overwhelm your senses and not paint a clear picture. I am certain that a few people did interviews in front of green screens in order to have a more professional looking background behind them (Note, this is just how it appears, technically I wasn’t there to prove if this is true). We have scary graphics that are not based in science, including Null’s own occasional voice over that seems extra deep and scary. We also have the occasional scary ghost doctor, as seen below, to look like an evil vaccine boogieman. Gonna get you with his science! Now clearly I went into this with my mind mostly made up. As a scientist, I am definitely willing to believe things that have been peer reviewed and tested over something that people are just assuming or drawing connections from personal experiences. But I still took notes, over 3 pages worth in my notebook, of claims that sounded far fetched, and the general notes that I described earlier. Like the claim about the Measels outbreak in Corpus Christi, that all of the people who got Measels had the vaccine and the ones without it (like practically no one) were fine. Well, the truth involves the people who got it did not have the antibodies, the people who were immune and safe did, meaning those who got it didn’t get the right amounts earlier in their youth to be fully immune. Cool. Moving on. They blamed vaccines on basically every neurological disease, not just autism things. Autism rates have increased over time, but so have our abilities to properly diagnose them, which is the best explanation for why we have more autism. It claimed that the flu vaccine for senior citizens is the cause of Alzheimer’s and dementia. There was a sentence about how future kids might not be fully human due to all the animal DNA in vaccines. It claimed that eventually Wakefield won his lawsuits from a judge and got reinstated, but honestly, I can’t find information confirming that anywhere. It said that vaccines were a form of population control. It used the phrase “just a theory” for a scientific theory. Just felt like medical conspiracy the movie. Sure, some legitimate concerns about too much government control in the lives of the citizens, or being in a police state. But they are exaggerating how far things are going, and it is still considered only a minor side point in this documentary. It is a topic that should have its own time to showcase, like…in its own documentary, and just serves as a distraction point in this one. At no point should anyone go out of there way to see this mess. From a technical documentary level it is bad. From a science level it is worse.